My family and I are headed to Florida this summer for a fabulous getaway. 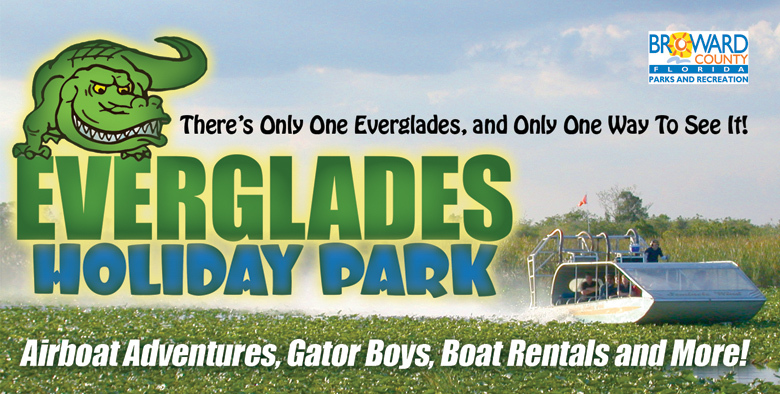 I am excited that one of our attractions will be the Everglades Holiday Park – Home of the Gator Boys & More!!! Everglades Holiday Park is home to the Gator Boys of Animal Planet fame. That’s right, most episodes are filmed right here in our world-famous Everglades park filled with Alligators! There’s a good chance that while you’re here visiting, you’ll see the Gator Boys filming. You might even get to meet one of the stars of the show! Yes, you’ve come to the right place if you’re a Gator Boys fan, as we’re their official home in the Everglades! Come on down to visit them here! Receive $4 off one adult and/or $2 one child Everglades airboat tour ticket which includes the animal presentation in our world-famous Gator Boys performance pit. Please present coupon at Ticket Counter. Not to be combined with other offers.